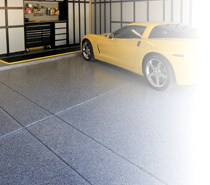 Slide-Lok's Garage floor coatings features excellent color and gloss retention, and are available in a wide variety of colors (garage floor samples shown below). Our Polyaspartic floor coating offers a unique coating technology that is UV resistant as well as more impact and abrasion resistant to the leading epoxy floor coating. Also, what makes our polyaspartic floor the best in the industry is our use of a coating that is 3x-4x stronger than epoxy, takes only 1 day to apply, and will not yellow, fade or chalk.